The Rolex 24 at Daytona is always the traditional starting point for the international motorsport season. The grueling 24 hour sprint has been noted to be a bigger challenge than the Le Mans 24 hours, and is this year is the curtain raiser for the renamed WeatherTech Sportscar Championship. This year also is the first of the newly GT3 spec GTD class, along with the high profile debut for the Ford GT programme in the GTLM class. All four classes are very hotly contested, and based on the times from the recent pre-race Roar before the 24 test, this race to set to be a thrilling encounter across all classes for the entirety of the 24 hours. The opening race preview looks at the contenders in the top Prototype class. After being the subject of much speculation this winter, the unique DeltaWing returns for another full season in the Prototype class. After a up and down year in 2015 the team returns with Sean Rayhall now replacing Andy Meyrick as the full season partner for the returning Katherine Legge. For the longer North American Endurance Cup events Meyrick returns, with the line up completed for Daytona by the German Andreas Wirth. With both Legge and Meyrick they will bring consistently quick times and experience with this unique car. Wirth is an established name and has shown his pace in his domestic ADAC GT Masters series. The only question mark surrounding him will be the length of time it will take him to adapt to both Prototypes and the DeltaWing. Sean Rayhall has shown his pace both in this series and Indy Lights in the past few years, and is now being rewarded with a full time step up to the Prototype class. He will likely be the teams young charger in the race, and despite the late announcement of this programme he will likely be up to speed with the car by the time of the race. Reliability has always been a crucial factor in endurance racing, and this entry will be looking to improve on their retirement last year after only 90 minutes thanks to transmission problems. The car showed impressive pace in the recent Roar before the 24, and if they can finally match reliability with the car’s pace this car could be in the hunt for a podium come the final hours of the race. The Extreme Speed Motorsport team are using these early season WeatherTech Sportscar Championship as a precursor for their 2016 World Endurance Championship campaign. 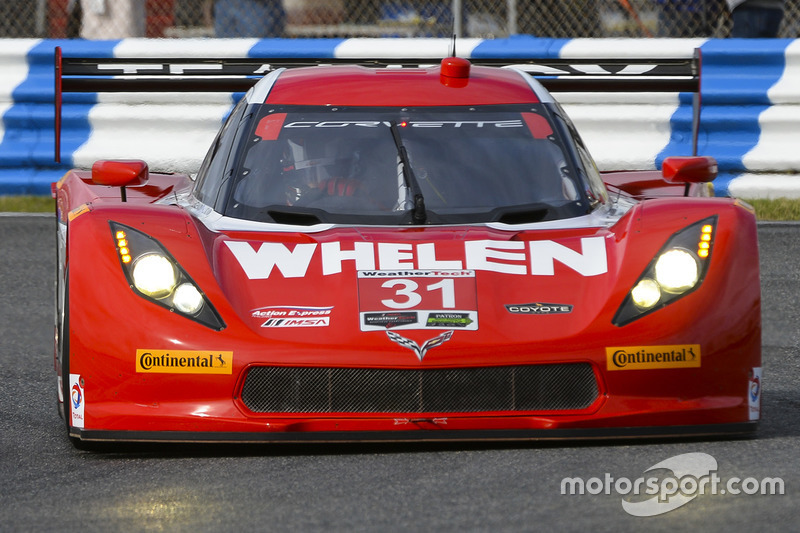 They return to the Rolex 24 with a tweaked driver line up this year. Team sponsor Tequila Patron CEO Ed Brown is the team’s amateur driver, and long term team mates Scott Sharp and Johannes Van Overbeek returning. Both are very experienced and quick prototype racers, and are well bedded into the team helping amateur driver Ed Brown. For this season the team have been joined by the very quick young Brazilian Pipo Derani. He made the transition to sportscars last year, and has joined the ESM team after they switched to Ligier chassis for this year. In his debut at Daytona Derani posted the fastest time in the pre-race roar before the 24 test. His 1m39.249 time is a big statement of intent from him and the ESM team that they are looking to win this Rolex 24 race. The Ligier JS P2 has fast become one of the premier LMP2 chassis, and as such with a hugely competitive field such as the Prototype the deciding factor will be down to unreliability and the ability to stay out of any drama’s and accidents over the first 20 hours. From there any subtle differences in car set up could be the deciding factor between victory and a place outside the top three. Whilst the ESM team will be primarily focusing on the WEC this year, the freedom of not racing for a championship can allow them to take some chances in this race that some of the other championship contenders may not wish to do. This is a strong team with a high quality driver line up. Whilst predicting the favorites is an impossible task across all four classes, this entry is one of many who can challenge for victory come the end of the 24 hour sprint that this race undoubtedly will be. The Action Express team return in 2016 with a largely similar line up that has yielded two championship years in 2014 and 2015. The team have established themselves as the team to beat in American sportscar racing, and have only grown stronger this year. The full season line up of Joao Barbosa and Christian Fittipaldi remains, and for this Rolex 24 they have signed two very quick drivers. Audi Sport driver Filipe Albuquerque joins the team and is a good addition, as any Audi sport prototype driver will be both very quick and consistent throughout the race. The headline signing for this team was American sportscar racing legend Scott Pruett. The very experienced Pruett is a legend of this race and jointly holds the record for most victories with five. At age 55 he is still a very fast and experienced racer, and his decades of knowledge of this race will be invaluable to the Action Express team. The team has a habit of always being in the running for victory late on, and will hope they this year they can avenge their defeat by the tiny margin of 1.3 seconds and repeat their 2014 victory. This team has all the tools and capability to win this race, only misfortune or unreliability will see them out of contention in the final hours. The Wayne Taylor racing team return for yet another crack at the Rolex 24, after near misses in the last few years. The team is unchanged last year with South African team boss Taylor retaining the dynamic partnership of his long time team mate “Max the Ax” Angelelli and his two sons Ricky and Jordan Taylor. This partnership has been unlucky multiple times and arguably should have a Rolex 24 victory of their CV if luck had gone their way. The team is one of the most competitive in the new WeatherTech Sportscar series, and much like Action Express can be counted on to be at the front in the final hours barring any misfortune. The Corvette Daytona Prototype is a proven package that is both reliable and fast, and with former winner Wayne Taylor running the team they have every chance of securing a very popular and long overdue victory in this Rolex 24 event at Daytona. The second Action Express entry is yet another contender for victory, with a very good driver line up and one of the best teams in the class. Full season drivers Eric Curran and Dane Cameron return after a breakthrough 2015 season. The duo combined for two wins and finished the year in third, only five points behind their team mates in the championship battle. Whilst this entry hasn’t had the attention it’s sister entry has, the #31 crew appear to be stepping out of the shadow of the #5 entry and will want another championship run this year. The best way to do this is to start the season well and the team have secured a very good lineup to help with this. Alongside quick amateur Curran and Cameron are Penske Indycar racer Simon Pagenaud and the Sunoco Whelen Challenge victor Jonny Adam. Pagenaud is a very quick sportscar driver and will provide both blistering pace and experience for this car, whilst Adam is a very quick British GT driver who will look to show his talents in the step up to prototype machinery. With the Action Express crew running the car this car has every chance of victory come Sunday afternoon, although it will face very tough competition if this car wants to secure victory, the perfect car set up will be one of the key’s to victory. Do not overlook this car as it’s a contender. The Russian SMP Racing team make their debut at the Rolex 24 this year, with their newly designed BRO1 car now looking to be a fully reliable and quick car after it’s introduction halfway through last season. The team are novices at Daytona and will therefore have a lot to learn during the race week, although with the LMP2 entries having an apparent slight edge on the Daytona Prototypes based on the pre-race roar before the 24, this team could be an outside shout for a podium if it can have a relatively clean run in the race. On the driving front the team has a very good line up consisting of their usual WEC roster. Ferrari backed driver Maurizio Mediani is a quick driver, with Nicolas Minassian and Mikhail Aleshin they have two very quick racers who will likely post the fastest times for this car. Completing the line up is the Russian amateur Kirill Ladygin, although he surprised everyone by posting the car’s fastest time in the pre-race test. This entry has plenty of potential to spring a surprise in the race, although the lack of experience from both the team and driver line up in this race will surely count against them as the race progresses. If the team can have a good run a podium is on the cards, but it will all depend on staying out of trouble and how their amateur rated drivers does. The #50 entry returns for an expanded 2016 calendar comprising the Tequila Patron North American Endurance Cup events. This is typically a Daytona only entry, with the charitable cause benefiting is typically the primary goal for this team. This year they have the highly professional Starworks Motorsport providing technical assistance to the team, although with a car that is now several years old and a largely amateur driver line up a good result for this team will be very tough to achieve. For this team however, attaining a good result is simply an added bonus and instead will simply enjoy driving in the race. The line up will be led once again by Fox Sports TV commentator and long term racer Dorsey Schroeder. Racing is now a hobby for the experienced American, although expect him to still be driving quickly and leading this entry in the race. Of the rest Jim Pace is one to look out for, as the experienced racer is a former winner of this race back in 1996 and can still turn fast times at this track despite his age. Bryan DeFoor, David Hinton and Thomas Gruber will be a solid pair of hands for this car, although don’t expect them to be setting the pace of the leaders in their stints. For this team finishing the race will be an achievement, with a top ten in class an added bonus for this team. The SpeedSource factory supported Mazda team return in 2016 with a petrol powered AER entries, after suffering with constant reliability issues with their previous Skyactiv diesel technology. The team appear to be back in contention based on their times at the pre-race roar before the 24, although testing times are hard to gauge as the real representative times won’t be set until qualifying. The team is experienced now in the series, and has a very good young driver line up in this #55 entry. Jonathan Bomarito provides years of sportscar experience a long with quick times in a car he is very comfortable with. His full season partner will be the young Tristan Nunez and he is a very quick up and coming sportscar driver. Whilst completing the line up the team completed a coup by signing Indy Lights champion Spencer Pigot. He appeared to have adjusted well to sportscars and was setting quick times in the pre-race test, so his stints in the race will be well worth watching. This team is somewhat of an unknown quantity going into the race thanks to it’s new petrol engine, therefore making a prediction on it’s form is very tough. If this team can remain trouble free with the new engine they will likely be in the hunt for a podium, although it’s not yet known if they have the last few tenths that will required to secure a podium placing in this race. 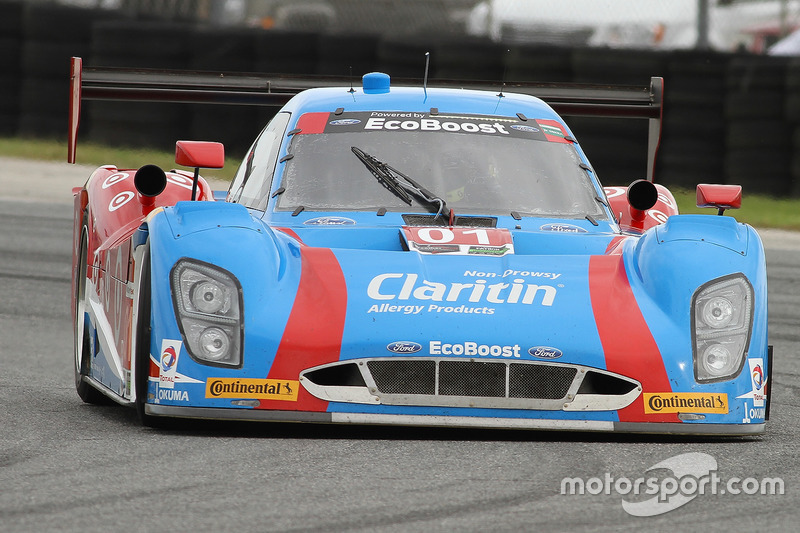 Michael Shank returns with his Ligier JS P2 for another crack at the race they won in 2012. The team were the first Daytona Prototype team to switch to the LMP2 spec Ligier, and with a year of running under their belts should come into this year’s race with a much better chance of victory. The team have been working on the lack of torque and drive ability that they suffered with last year. This will be crucial especially for the experienced amateur rated driver John Pew, and could he could be the difference between victory and a podium place come the final hours of the race. Full season partner Ozz Negri Jr returns once again as does Nascar race AJ Allmendinger, and this year are joined by on-loan factory Ford driver Olivier Pla. The very quick Frenchman spent last year with the Nissan LMP1 programme, and has extensive experience with the Ligier JS P2 prototype. With a high quality driver line up like this and a quick car underneath them, only misfortune will likely stop this team fighting for victory. This entry is right up there with any other in the class for victory and don’t be surprised to see this car driving into victory lane immediately after the race. The second SpeedSource Mazda entry is this #70 car, which was also looking very quick in the pre-race test. The team’s issues appear to have been solved thanks to the new petrol powered AER 2.0 litre engine. The SpeedSource team has plenty of experience and factory Mazda assistance so therefore will be strong with pit stops and strategy in the race. On the driving front the team has a good, solid line up that will be able to get them to the finish in a good position. Ben Devlin will likely take on the role of the experienced driver thanks to almost 15 years of prototype experience across Europe and America. Tom Long has been associated with Mazda for most of his career and also brings plenty of experience to this entry. Completing the trio is Joel Miller, who has adapted well in the past few years since switching from single seaters to sportscar racing. There will be almost nothing this team and driver line up will not have seen before with this race, and this experience could prove crucial in a race that will be likely decided by the smallest of margins. If the new AER engines can remain reliable this team has the chance of a overall podium, which would be a huge result for the SpeedSource team. The Spirit of Daytona squad came within a whisker of winning last years championship after leading it for most of the season, yet has decided to change their driver line up for 2016. Gone are the previous long term pairing of Richard Westbrook and Michael Valiante, with Ryan Dalziel and Marc Goossens replacing them. Both Dalziel and Goossens are very quick and experienced sportscar racers, with Dalziel winning the race in 2010 whereas Goossens brings over twenty years of racing experience. The new full season line up is joined for Daytona by former Indycar and Indianapolis 500 winner Ryan Hunter Reay. He will bring pace along with years of experience from competing in this race. With a team that was arguably the best in the class last year, along with a driver line up containing this much experience and pace this entry is one of half dozen that are serious contenders for overall victory. For the local Spirit of Daytona team this would be a huge achievement and no one could begrudge this entry victory. The fabled Chip Ganassi Racing team return for another season in the prototype class, despite also taking on the race debut for the works Ford GTLM programme this year also.The team once again brings two Riley-Ford’s to Daytona and will be looking to repeat their win from last year. In recent years the Chip Ganassi team have dominated this race, winning three of the last six. This year the #01 has an all star driver line up of long term F1 and sportscar driver Alex Wurz, touring car and GT fast man Andy Priaulx, current WEC champion Brendon Hartley and up and coming F3 racer Lance Stroll. This line up is likely the best in the class in my opinion, with Wurz and Priaulx providing years of experience along with plenty of pace to boot. It’s likely Hartley and Stroll will be the all out attack racers of this entry, although for Stroll he is still adjusting to the Riley Daytona Prototype. He suffered an accident in the pre-race test which hampered them, although his experience will only improve during race week. With such an all star team and line up, only mechanical misfortune or a mistake from one of the drivers will likely stop this team. Amongst a potential half dozen serious contenders a lot of people would likely bet on this car if they were forced to. It will be interesting seeing how this car gets on throughout the race, don’t expect it to be far from the top of the timing screens all race. The second Chip Ganassi racing entry comes into the race as defending champions from last year. Whilst the #01 has taken a lot of the pre-race press attention, do not ever discount this #02 entry as they are more than capable of repeating their victory from last year. Team boss Chip Ganassi has smartly retained his mixed roster of Indycar and Nascar racers this year, after their big success last year. Indycar duo Scott Dixon and Tony Kanaan are both very quick along with experience. It was the uncanny fuel saving ability of Dixon last year that played a part in their close fought victory, with Nascar racers Kyle Larson and Jamie McMurray swapping their stock cars for another crack at the Rolex 24. The #02 slightly edged the #01 in the pre-race test, although choosing between the two will be very difficult to do until the early hours of the race have passed. Both entries have an equal chance of victory, and if any team will win this race it’s hard to look past the Chip Ganassi outfit. This entry in particular has a winning pedigree, one that it will want to continue this year. That concludes my preview of the prototype class for this year’s eagerly anticipated Rolex 24 hours at Daytona. As I’ve mentioned above there are half a dozen very serious contenders for victory, with a further half dozen likely to be in the hunt for victory if any of these teams slip up or suffer from misfortune in the race. Predicting a winner before the race is impossible, it will be thrilling to watch the race unfold and see who is in the right position to claim victory. Coming up in the next few days will be my preview of the prototype challenge class, so stay tuned for that. I have to give huge credit to Motorsport.com for their incredibly high quality photos used in this preview and I encourage everyone to visit their website at Motorsport.com for all the latest news and high quality pictures from around the motorsport world. Finally I wanted to say thank you for making it this far and reading the article, I would greatly appreciate any feedback both positive or negative I want to hear your thoughts on this article.